More than half the men’s seeds in play, including four of the Top 10, were shocked out of the ATP Rogers Cup in Montreal on a chaotic Wednesday. No. 3 Stan Wawrinka, No. 5 Tomas Berdych, No. 6 Marin Cilic, No. 9 Gilles Simon, No. 14 Grigor Dimitrov and No. 15 Gael Monfils were all shown the exit, with unseeded Americans and Aussies doing the majority of the upset damage. American qualifier Donald Young sent out the No. 5-seeded Berdych 7-6(5), 6-3, and Jack Sock downed the No. 14 Dimitrov 5-7, 7-6(5), 7-5. Young will next meet fellow qualifier Ernests Gulbis who defeated Czech Lukas Rosol earlier. Sock saved a match point against Dimitrov in his second win over the Bulgarian this year. Other upset-makers were Aussie Nick Kyrgios beating the No. 3 Wawrinka 6-7(5), 6-3, 4-0 ret. (back injury) in the late night match; Aussie Bernard Tomic ousting No. 6 Marin Cilic 6-3, 6-4; Russian Mikhail Youzhny defeating No. 9 Gilles Simon 6-1, 6-4; and big-serving Gilles Muller edging No. 15 Gael Monfils 6-3, 3-6, 7-6(4). Top 10 seeded winners on the day were No. 2 Andy Murray over Tommy Robredo 6-4, 7-5; No. 4 Kei Nishikori rolling past Pablo Andujar 6-3, 6-3; No. 7 Rafael Nadal working past Sergiy Stakhovsky 7-6(4), 6-3; and No. 10 Jo-Wilfried Tsonga outlasting Roberto Bautista Agut 5-7, 7-6(6), 7-5. Kyrgios will next meet No. 16 John Isner, who on Wednesday beat beat Vasek Pospisil 7-6(1), 4-6, 6-3. On the women’s sides five seeds advanced, and five seeds fell on an equally ugly day at the Rogers Cup in Toronto where a former No. 1 and a former two-time Slam champ were shown the door in second round play. Not much of a surprise was No. 3 Petra Kvitova going out 6-2, 6-3 to former No. 1 Victoria Azarenka after the former announced she was battling mono, but a big surprise was the continued breakthrough of Swiss Belinda Bencic, who out-steadied No. 4 seed Caroline Wozniacki 7-5, 7-5. Bencic will next meet Sabine Lisicki, a 7-6(3), 6-4 winner over Czech Barbora Strycova. Orchestrating other second-round upsets were Russian Daria Gavrilova coming from a set down to beat No. 7 Lucie Safarova 4-6, 7-5, 7-5; Ukranian qualifier Lesia Tsurenko rolling past No. 8 Garbine Muguruza 7-5, 6-1; and Slovenian qualifier Polona Hercog outlasting No. 11 Ekaterina Makarova 6-2, 6-7(7), 7-5. Top 10 seeds avoiding the upsets were No. 2 Simona Halep beating former No. 1 Jelena Jankovic 6-3, 6-4; No. 5 Ana Ivanovic edging Belarus qualifier Olga Govortsova 6-4, 7-6(4); and No. 6 Aggie Radwanska defeating German Julia Goerges 7-5, 6-3. Next up for Halep is No. 13 Angelique Kerber, who eased past Puerto Rican qualifier Monica Puig 6-2, 6-3.
berdych, dimitrov, raonic, wawrinka, cilic … they’re all hopeless on hardcourts and their careers are over. especially berdych. losing to donald young just shows how shot he is. even getting rid of uncle toni won’t help him now. I sense sarcasm in the above post……I like it. Think the ATP remotely does anything to Kyrgios? With the way Gimelstob (I know, he’s a tool) was talking it did’t seem like anyone expect much more than a slap on the wrist. oh, sad for vasek. so close. and surprised stan lost to nick, but watch him win the us open, lol. that’s stan – streak-meister! missed all the matches but hoping for dry conditions tomorrow. Ooh, lots of “big” names out. I think the ATP draw is BS. I’m going with the conspiracy theory I briefly explain. Let me know. Accident? Coincidence? without Roger in the they find no honor in taking this tourney. saving it for real thing. Hi, Matt! I often read your blog. Lot of good articles. Not defending any point at all stands to the advantage of Rafa. From hereon, every win of his will earn him points and I think in another three to four months, we can expect him in the top 5 atleast !! Nice article, just to correct you, Nole won in two not three sets and Stakhovsky is Ukrainian not Russian:) (though he could be ethnic Russian from Ukraine). It would be great if you would tweet updates to your blog. It should be very easy to set up, and would surely gain you followers. Michael youve said this before,but i dont think having no points to defend is any sort of guarantee that you will automatically do well,different players do well at different parts of the season the indoor HC season has never been his strong part of the year,but hope your right though…. Enjoy your writing Matt! First time reading that. Wog Boy is right. Just a little oops there at Staks being Ukrainian, not Russian. Thanks for the catch, Wog Boy. Tough two setter. First set was bit of nail biter . . ha. Thanks for the feedback, Howard. I’m not the savviest social media type. Will work on a twitter for the blog. I like Sock, he bustles round the court with great energy like an eager fox terrier. He needs to be a little more patient and a lot more accurate before he can challenge the top players, however. Nole has the first set and a break in the 2nd. Sock having probs keeping his forehand in court. And Nole wins easily in 2.
good job novak. wasn’t sure what to expect. 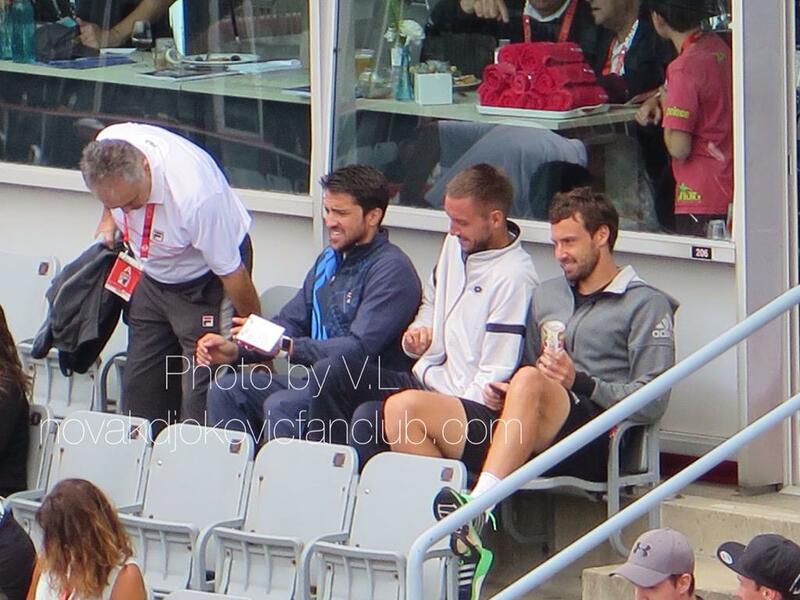 sock played a nice match versus rafa at the french and these 2 hadn’t met before. Trying to sleep but just woke up and watched it. That was a tennis lesson for Jack. Now Simona v Kerber is keeping me awake. Kerber has been super strong lately. Tough match. Practically purring. Damn impressive from Mr Murray Magic. Lots of fab drops and lobs and some great volleying too. Murray is playing great I think, just wished he come to the net more, today he was 6 out of 6 at the net. Specially against a potential match with Djoko. The good for him is that he most likelly will play Kei in semis, which is a version of Djoko and will be tested for finals, while Djoko will play either Chardy or Irsner/kyrgios. Can’t see Nadal beating Kei in quarters who looks in the zone this last few matches. Indeed, Gulbis decided to play, faced no BP, but Young is not really a match for him. jane, I watched Nole v Jack. That was masterclass. Okay there is a chance. But it’s unlikely. Ernie has to be getting tired – this is a streak for him. Gulbis to serve for the match, lats time he served he face a few BP’s. But if he keeps serving as he has, straight st wins for him. And then Kyrgios x Isner, which I am kind of curious to see if Kyrgios will be affected by his actions or if he will just play some game. Oh yeah, Isner and Kyrgios. This will be the first time I have ever rooted for Isner. Just knock him out Big John! Kyrgios was still jawing, this time with fans. He rushes his serve, seems to show disinterest at times. . . he just doesn’t seem to care very much, evidenced most recently, of course, by his treatment of Stan. He was talking with the one fan while Isner was trying to serve. Ha! Unreal. Gulbis has a similar disposition. Huge game, but gets distracted, talks a lot. His forehand started to abandon today. If he messes around vs. Novak, short match. Would love to see him give Nole some competition.